This is the first part of a two part biography of William Holt Yates Titcomb (1858-1930), produced to accompany the 2003 Titcomb Retrospective at Penlee House Gallery & Museum, Penzance. Titcomb was an acclaimed figure painter, who had 44 works hung at the Royal Academy, and whose work is represented in Public Galleries in Toronto, Nottingham, Bristol, Truro, Doncaster, Oldham, Southport, Dudley and the V & A. This first part covers his life until 1908. Although born in Cambridge on 22nd February 1858, Titcomb was bought up in Lambeth where his father, the Reverend Jonathan Holt Titcomb, was vicar. He attended Westminster School, where a drawing of a madrigal society was noticed by Sir Edmund Poynter and, so encouraged, he studied art at South Kensington, winning a prize in 1878, and at Antwerp under Charles Verlat in 1879. At the end of 1880, he travelled to Burma where his father was the first Bishop of Rangoon and the way he overcame the difficulties he experienced in painting the Burmese and became known as ‘The Royal Artist’ are set out in an illustrated article in The Graphic (19/12/1885). The oil paintings from this trip, some of which are in their original ornate Burmese frames (Bristol), are highly finished, intricate works, capturing the exotic colours of Burmese dress and tropical fruits. Titcomb certainly believed that his visit taught him a new set of colour values. On his return, he went to Paris to study at Julian’s Academy under Boulanger and Lefebvre and it is highly likely that during his time in Antwerp and Paris, he will have met many of the other young British artists who were to become colleagues in Cornwall. However, Titcomb decided to pursue yet further study at the new Bushey School of Painting, set up by Hubert Herkomer in 1883. Titcomb was one of the initial intake and stayed for the full two years. The socio-realism of his later work indicates that Herkomer was a major influence. His first Royal Academy exhibit in 1886, Fresh This Morning, depicting a fish stall in a continental market square, not only confirms that Titcomb travelled abroad, probably to Brittany, after finishing at Bushey, but also that he was already painting Newlyn type scenes in the French manner. It is no surprise then that, in 1887, having become more financially independent following the death of his father, he settled in St Ives. Titcomb’s reputation as one of the leading members of the Cornish art community was made by Primitive Methodists at Prayer, St Ives (Dudley Art Gallery), which was exhibited at the RA in 1889 and won a medal at the Paris Salon in 1890. It went on to win medals at Chicago in 1893 and at the Franco-British Exhibition in 1908. Due to the hazards of their livelihood, the Cornish fishermen relied heavily on their religious beliefs, calling their faith "the best and brightest part of life". This aspect of the fisherfolk’s lives is largely ignored by the other Newlyn School artists, but Titcomb, unconcerned about the uncommerciality of the subject, returned to the theme repeatedly. Piloting Her Home (RA 1894, Paris 1895) (Toronto) and A Mariner’s Sunday School (RA 1899) (Doncaster) both again feature the St Ives Primitive Methodist congregation, whereas A Pilot (RA 1905) and The Church in Cornwall: A Rogation Day Procession (RA 1906) (Cheltenham) demonstrate the impact on the local fishermen of the young curate, Bernard Walke, whose strong Anglo-Catholic beliefs were to result in such controversy later at St Hilary. 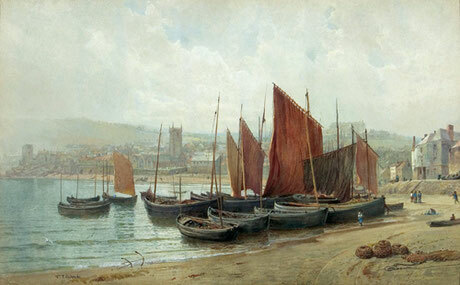 Titcomb also produced some typical ‘Newlyn’ subjects. 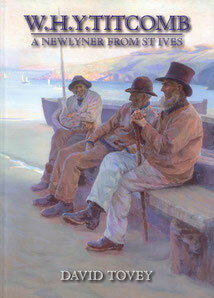 Old Sea Dogs (RA 1891, Paris 1892, Chicago 1893), depicted on the front cover of the book, is a real tour de force painted boldly in the French manner, and shows three old fishermen sitting on a bench on the harbour beach, lost in their memories. It was bought by Nottingham Castle Museum from the Cornish Artists exhibition at Nottingham in 1894. Jubilee Day, St Ives (Oldham), depicting St Ives harbour decorated with bunting and streamers for Queen Victoria’s Jubilee in 1897, was originally not accepted for the RA but was resubmitted successfully in 1900 under the title Good News from the Front, shortly after the town celebrated in similar fashion the relief of Ladysmith in the Boer War. Till Death Us Do Part (RA 1893) (originally Dusseldorf) is an archetypal Newlyn School death bed scene, but free from the excessive sentimentality that characterises much of Langley’s treatment of this theme. Titcomb’s desire to avoid repeating scenes or themes was helped by the fact that, on his father’s death, he inherited property in Wickersley in Yorkshire. Most years, he spent several months there, painting local industrial scenes and, in these, he again demonstrated his concern for the plight of the poor and the conditions under which they had to work. The Wealth of England : The Bessemer process of making steel (RA 1897) (Sheffield Industrial Museum), which was painted amidst great discomfort on the spot in a Rotherham steel works over a period of three months, was included in the Victorian Vision Exhibition at the V&A in 2000 and was perhaps inspired by Stanhope Forbes’ Forging the Anchor. Titcomb married a fellow artist, Jessie Morison, in 1892 and their children, Frank and Loveday, were born in 1898 and 1900 respectively. Believing German education to be superior at that time, they decided to move to Dusseldorf in 1905, where Titcomb continued to paint major figure paintings, but, with the rise of nationalism in Germany, they decided returned to England in 1909.